Fri., September 21, 2018 11:39 a.m. | Friday, September 21, 2018 11:39 a.m. The Poulet Bleu is on Butler Street in Pittsburgh’s Lawrenceville neighborhood. Restaurants and shops glow at dusk along Butler Street in Lawrenceville. Check out these restaurants as fall comes and the weather cools. From French cuisine and Korean favorites to soul food and fried chicken sandwiches, these Pittsburgh restaurants feature can’t-miss menus no matter what you’re hungry for. 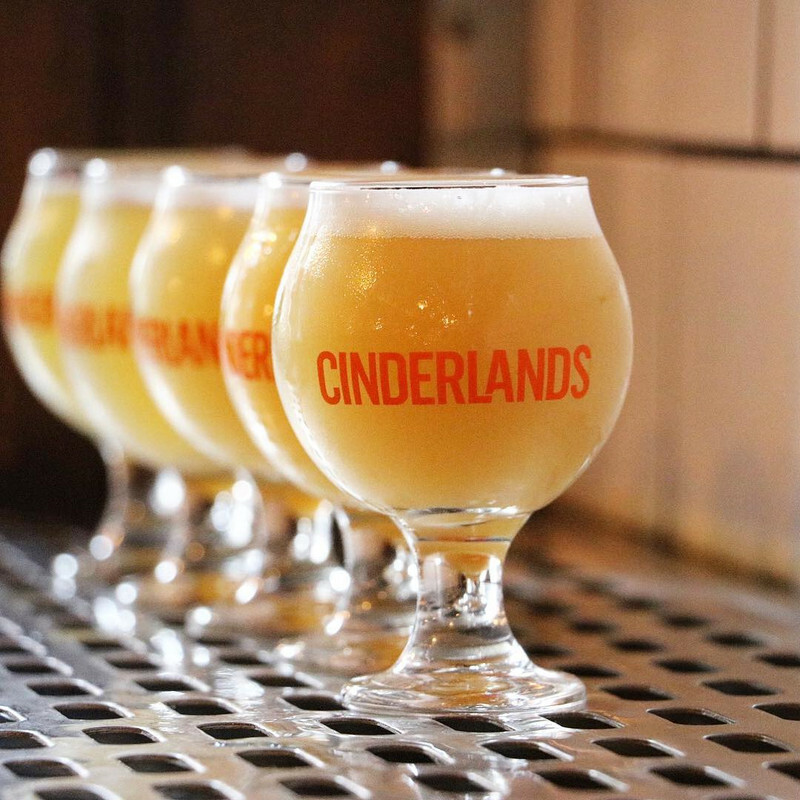 Their drinks and tap lists will even quench your thirst. 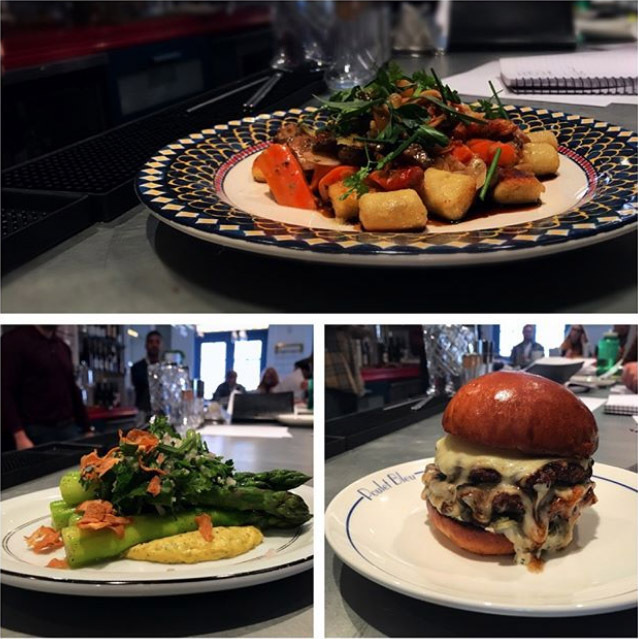 Why the buzz: Poulet Bleu comes from Pittsburgh chef Richard DeShantz, the mastermind behind buzzy Meat & Potatoes, Butcher and the Rye, täkō and Pork & Beans. This time around, DeShantz is foregoing tacos and barbecue and going high-end by embracing a French bistro concept. Expect a French wine collection and a more sophisticated menu than what you’ll find at Pork & Beans. On the menu: The menu is “full classic and approachable” according to a review in Pittsburgh Magazine . Reviewers are already raving about the $15 French onion soup. Other items of note on the menu: Lobster spaghetti, Trout almondine, filet mignon, and parisienne gnocchi. 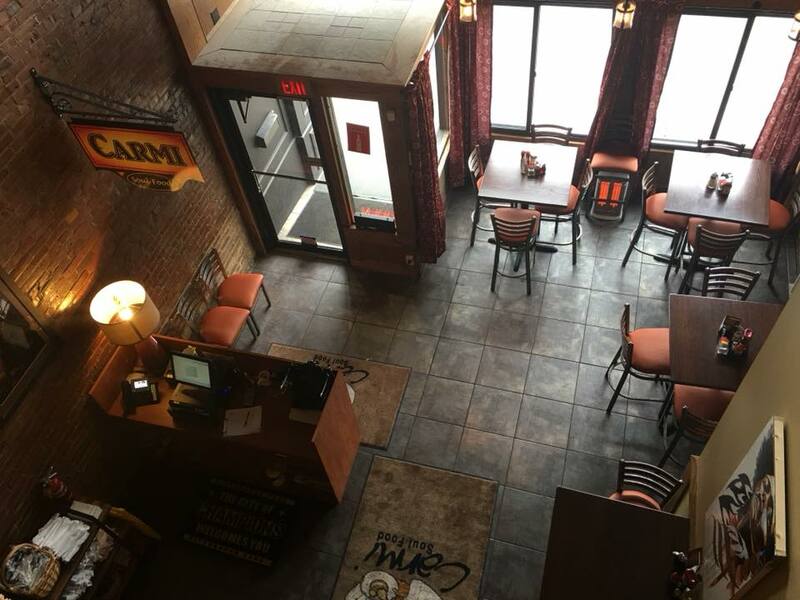 Why the buzz: Carmi was a staple of the North Side, where it gained a reputation as having the best finger-licking soul food in the region. Oscar-winning actors Denzel Washington and Viola Davis visited the North Side location when they were in town, and so did Steelers players and politicians. Owners Mike and Carleen King relocated to the South Side earlier this year after their former landlord sold the North Side building. On the menu: Expect dishes prepared with locally sourced ingredients but a Southern flair: fried chicken, stuffed pork chops, smoked pork spare ribs and chicken and dumpling soup. Specialties include shrimp and grits and chicken and waffles. The drink menu features signature cocktails like “Soulmosa” (sparkling white wine and tropical fruit blends) and “Last Call” (moonshine and peach puree). Why the buzz: It has a prime location in trendy Lawrenceville and bills itself as a “craft brewery and scratch kitchen.” It’s a casual spot yet the food doesn’t feel pedestrian. In other words, it’s a nice marriage of good beer and creative grub. On the menu: You won’t find traditional bar food here. Instead, expect inventive appetizers like marcona almonds and blue-cheese stuffed dates. The main plates include a fried chicken sandwich topped by creamy broccoli-cheddar blend as well as lamb and New York strip steak. 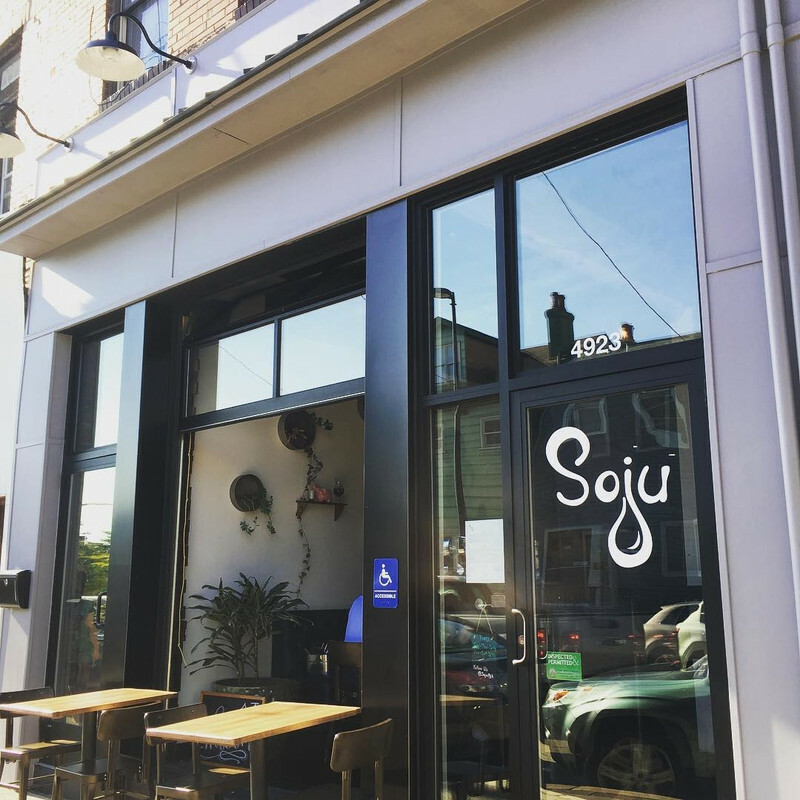 Why the buzz: Owner Simon Chough, who is Korean American, spent six years planning Soju, which specializes in Korean cuisine. Reviewers on Yelp are raving about the kimchi dumplings and gimbap (seaweed rice rolls). On the menu: Korean favorites like sautéed dumplings, kimchi pancakes, katsu (panko-breaded fried chicken), Korean-style BBQ short ribs and the traditional bibimbap (a rice bowl with cooked vegetables and beef). There’s also a solid cocktail menu with plenty of soju, a vodka-like liquor from Korea. 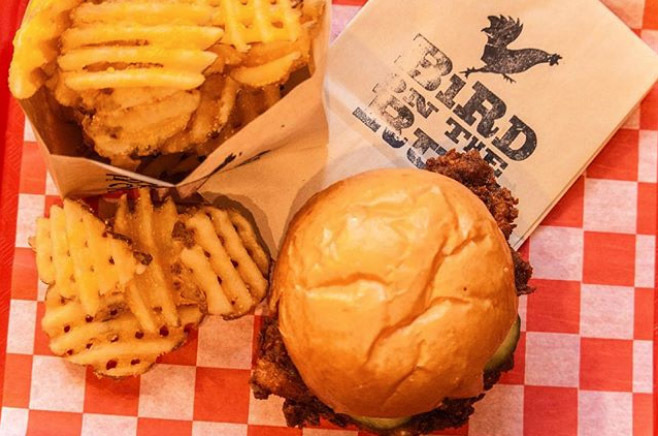 Why the buzz: The chicken sandwiches are fantastic — gigantic and very affordable. Bird on the Run pretty much only does chicken, and it does it very well. There’s also a collection of beer and frozen alcoholic drinks. Did we mention the waffle fries? Come for the interesting wallpaper. Stay for the chicken sandwiches on buttery buns. On the menu: A straight up Chicken Sandwich, on a brioche bun with mayo and pickle costs $8. Or upgrade to the Lil Chunky’s Chicken Deluxe, which comes with lettuce, cheese, bacon, pickled green tomatoes, a sunny side up egg and spicy mayo. The cost: $11.